After some time of implementation and testing, the new version of GPdotNET is out. Go to codeplex page and download it. 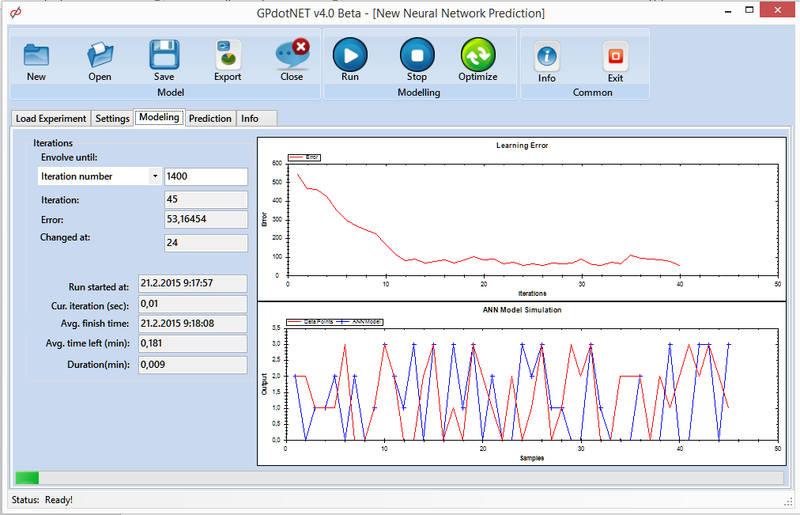 This is huge step in development of this project, because it contains completely new module based on Artificial Neural Network and other optimization methods e.g. Particle Swarm Optimization. Almost all aspects of the architecture are changed, or will be changed when this version would be released. The new Experiment class will replace existing classes for handling experimental data in GA based models, which is not implemented yet. Also New start page will contain more pre-calculated examples. New Start Page will be extended with new examples of Neural Nets : – binary classification, – multiclass classification and – regressions examples. Improved module for loading experimental data, which now supports nonnumeric data like categorical or binary data. Depending of the output column of loaded experimental data different learning algorithm is selected. 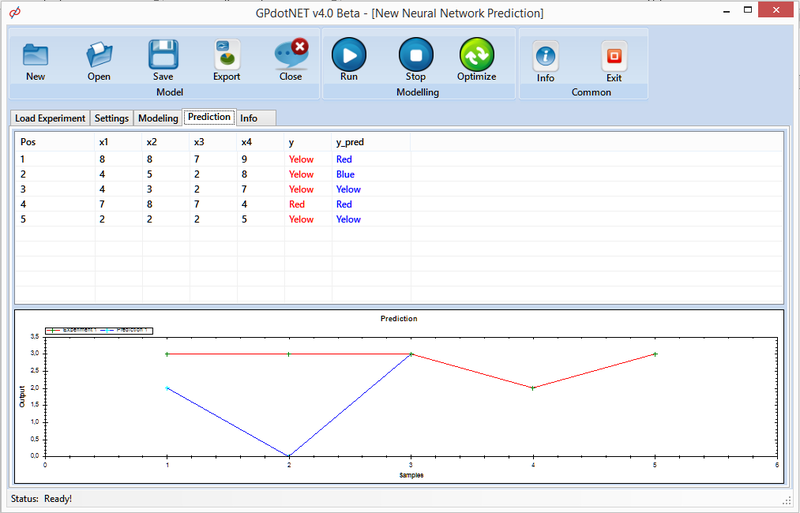 For example if the column is of categorical type, GPdotNET selects Neural Net algorithm with Cross-Entropy and Particle Swarm optimization learning algorithm. 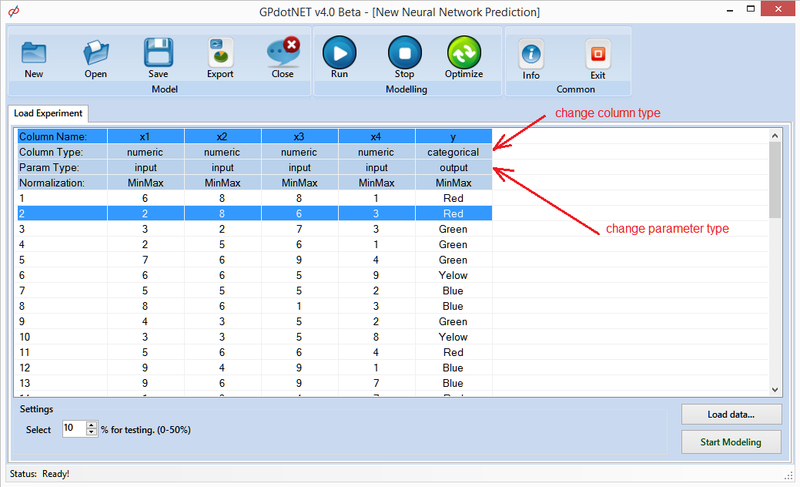 If the output column is numerical, GPdotNET selects the Neural Nets with Backpropagation learning algorithm. Currently only two learning algorithms are implemented. More will be implemented in the next beta release. 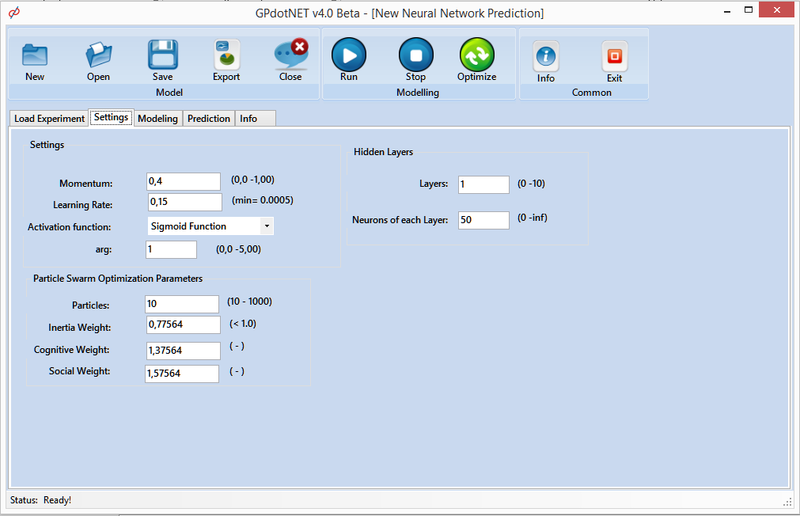 This topic will give quick tutorial how to model classification problem with GPdotNET by using Neural Nets. For this tutorial you need some experimental data which you can download from this location. New Dialog pops up, check Artificial Neural Nets, and Press Ok Button. 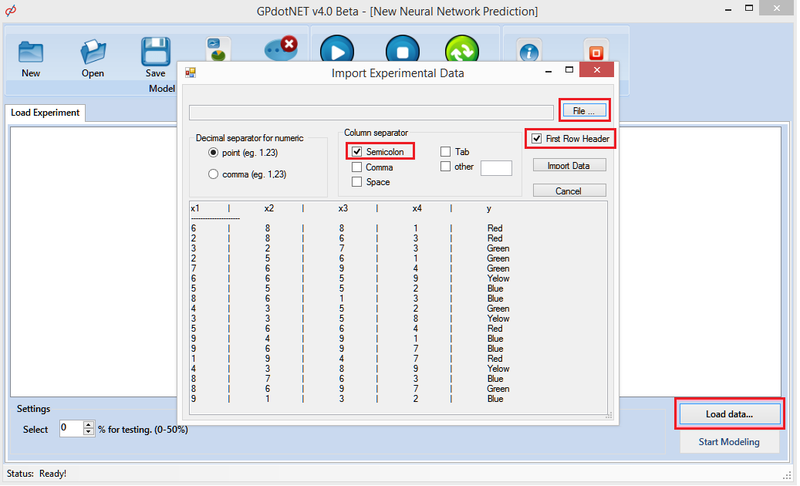 After Solver Type selection, GPdotNET Creates “Load Experiment” Page in which you can load experimental data, and define the percentage of data for testing the model. Press File button select the file you previously downloaded. Check Semicolon and First Row Header check buttons. Note: When the data is analyzed correctly you should see vertical line “|” between columns. Otherwise data will not be loaded correctly. When the experimental data is formatted correctly, press the “Import Data” button. The next step is preparing columns for modeling. 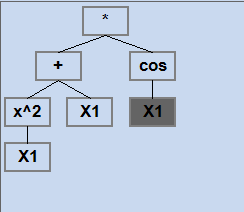 c) normalization method (MinMax,Gauss or Custom normalization of the column values ). To change Column Type, double click on the cell which shows the column type, combo box appears with list of available types. To change Parameter Type, double click on the cell which shows the param type, combobox appears with list of available parameter types. 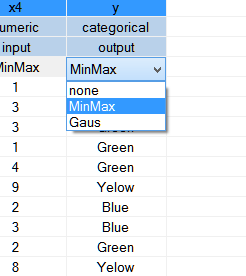 To change Normalization Type, double click on the cell which shows MinMax value, combobox appears with list of available normalization types. 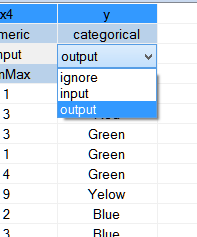 Note: you can set only one Output column. Put Parameter Type to Ignore if you want to skip column from modelling. Now we have experimental data, and we can start modelling process. Before that we need to choose how much data will be treated for testing. Enter 10% for testing the data and press Start Modelling button. 3. 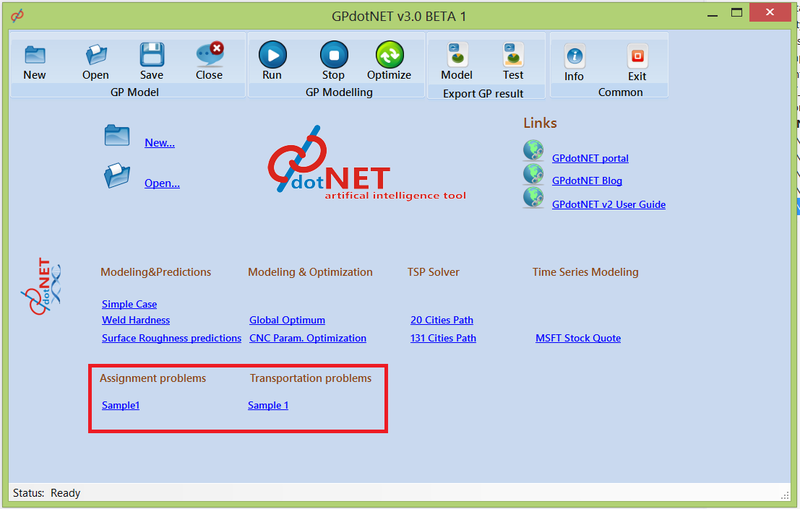 Prediction page which you can see how solution is good against testing data. As you can see in Settings Page you can set various parameters for Neural Nets and Particle Swarm Optimization. Try to train the model with different parameters values. For this tutorial you can leave parameters as are. Modeling page contains two diagrams. The first diagram shows errors with respect of the iteration number which is very useful for monitoring the searching process. The second diagram which is below the previous shows current best solution (blue line) in comparison with the experimental data (red line). Also on the left side of the page, you can see several iteration number, error, and other information about searching process. Prediction page shows how current best model predict data. 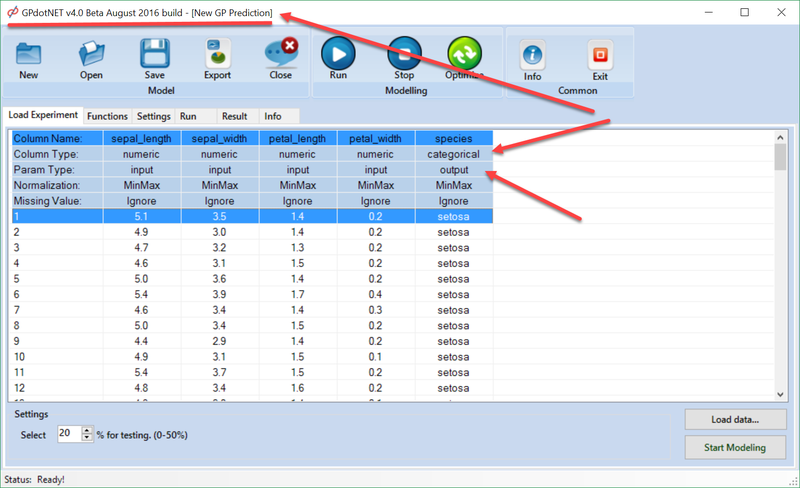 Predict page contains tabular and graphical representation of predicted data, which is compared with data for testing. 8. Scientific paper, Thermophysics 2012: Evolution algorithms as toolfor optimization of water vapour transport properties of cellular concrete. 13. Book By AKERKAR, RAJENDRA, Introduction of Artifical Intelligence. I am asking for feedback and bug reports. If you find something strange post a comment here on anywhere in blog site or codeplex site. I will try to answer as quickly as possible. 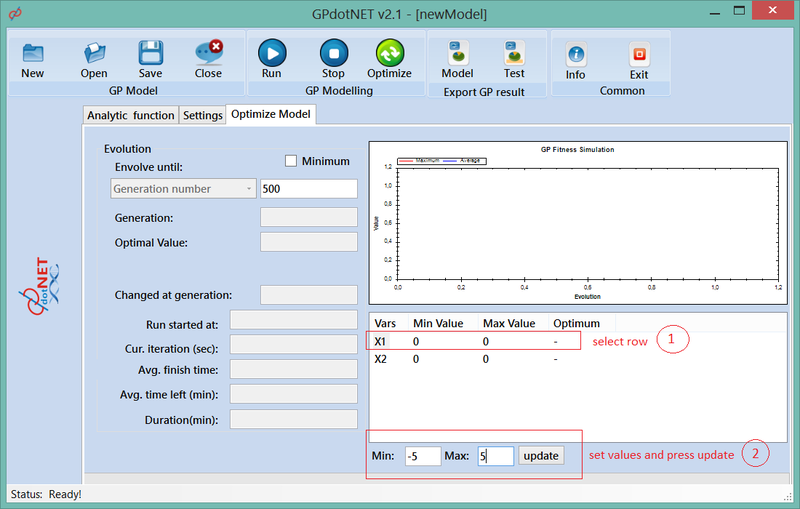 With releasing of GPdotNET v2 it is also possible to find optimum for any analytic function regardless of independent variables. For example you can find optimum value for an analytically defined function with 2, 5, 10 or 100 independent variables. By using classic methods, function optimization of 3 or more independent variables is very difficult and sometimes impossible. It is also very hard to find optimum value for functions which are relatively complex regardless of number of independent variables. 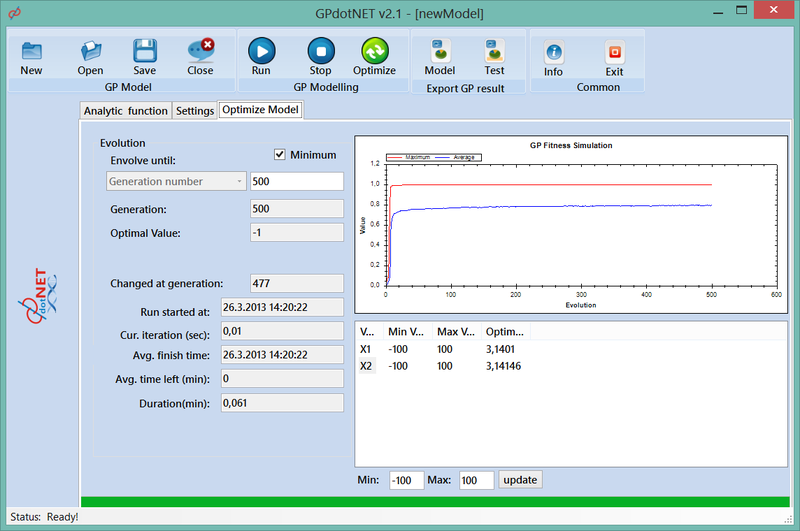 Because GPdotNET is based on Genetic Algorithm we can find approximated optimum value of any function regardless of the limitation of number of independent variables, or complex definition. 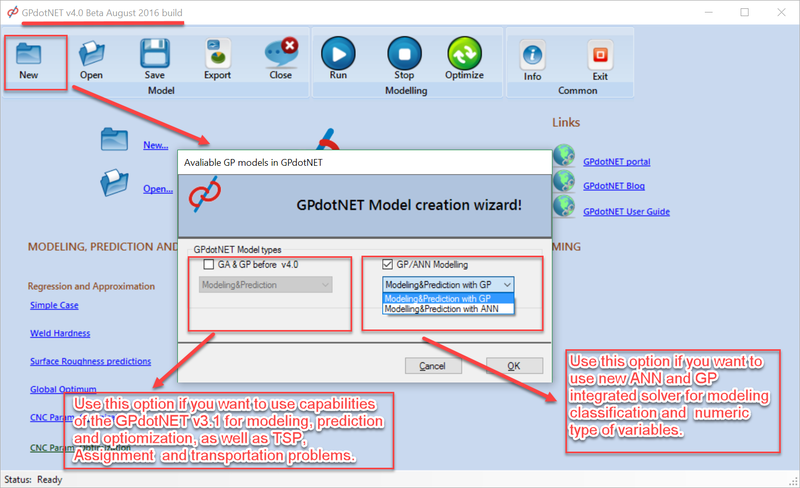 This blog post is going to give you a detailed and full description how to use GPdotNET to optimize function. 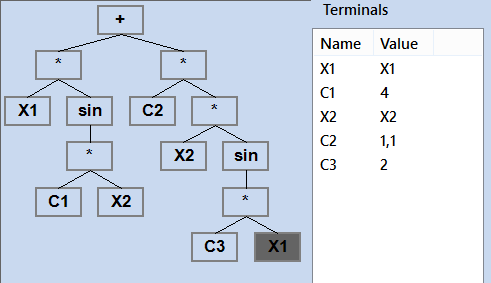 Blog post will also cover C# implementation behind optimization proce by showing representation of Chromosome with real number, as well as Fitness calculation which is based on Genetic Programming tree expression. 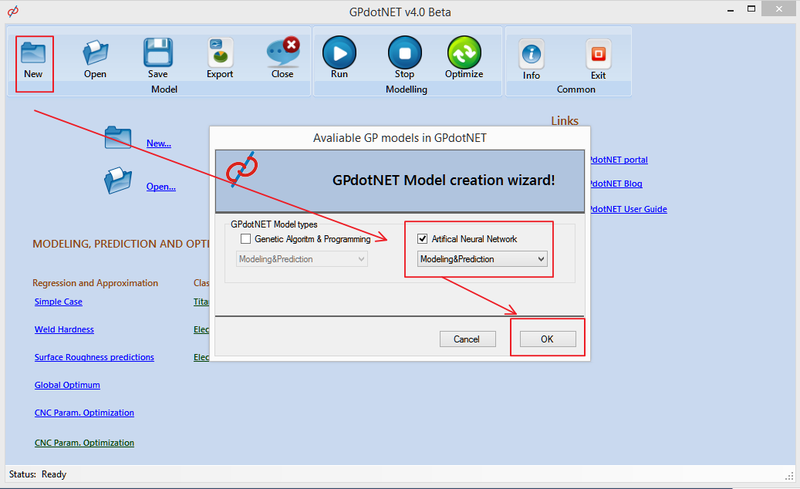 In this blog post it will also be presented several real world problem of optimization which will be solved with GPdotNET. 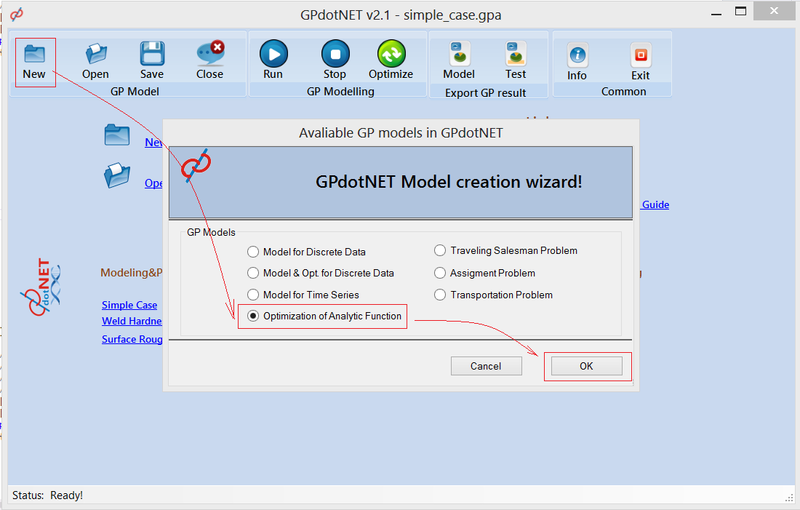 When GPdotNET is opened you can choose several predefined and calucalted models from various domain problems, as weel as creating New model among other options. By choosing New model new dialog box appears like picture below. 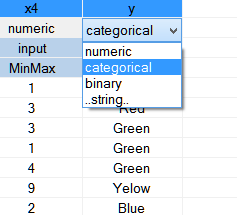 By using “Analytic function” tab you can define expression of a function. More information about how to define mathematics expression of analytic function can be found on this blog post. By using “Analytic definition tool” at the bottom of the page, it is possible to define analytic expression. 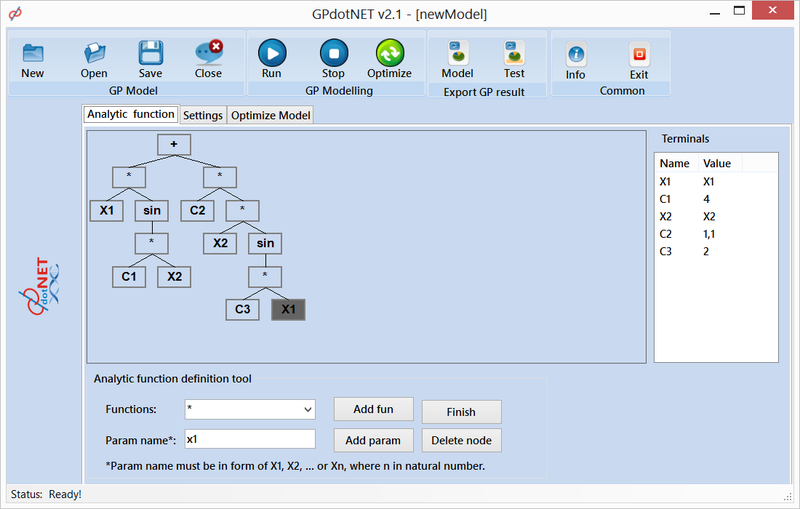 Expression tree builder generates function in Genetic Programming Expression tree, because GPdotNET fully implements both methods. 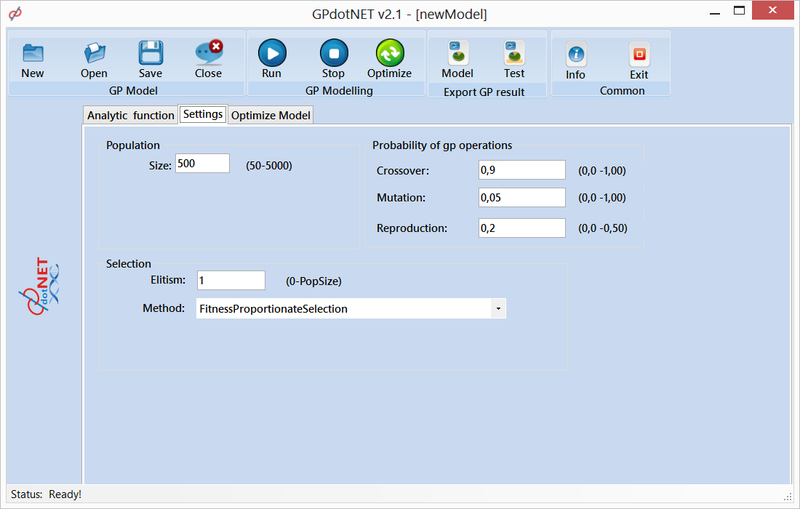 Sharing features of Genetic programming in Optimization based Genetic Algorithm is unique and it is implement only in GPdotNET. When the process of defining function is finished, press Finish button in order to proceed with further actions. Finish button action apply all changes with Optimization Model Tab. So if you have made some changed in function definition, by pressing Finish button changes will be send to optimization tab. 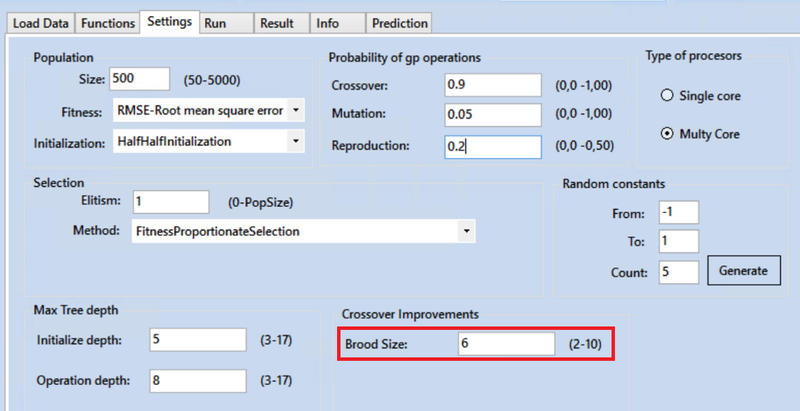 The second step in optimization is setting Genetic Algorithm parameter which will be used in optimization process. Open the Setting tab and set the main GA parameters, see pic. 3. 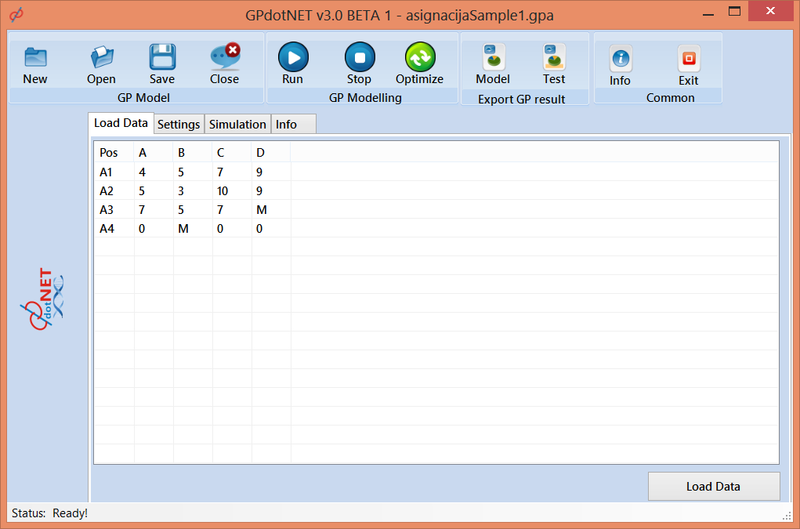 These parameters are general for all GA and GP models. More information about parameters you can find at https://bhrnjica.net/gpdotnet. Perform these 3 actions for each independent variable defined in the function. 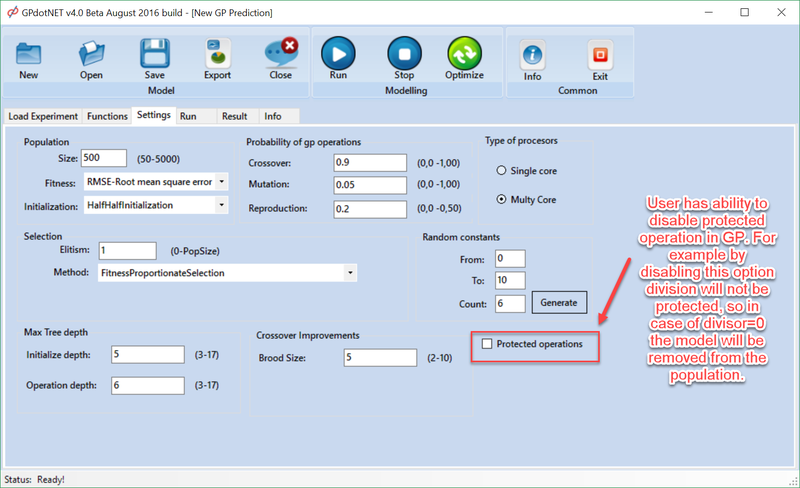 When the process of defining constrains is finished, it is time to run the calculation by pressing Optimize button, from the main toolbar(green button). 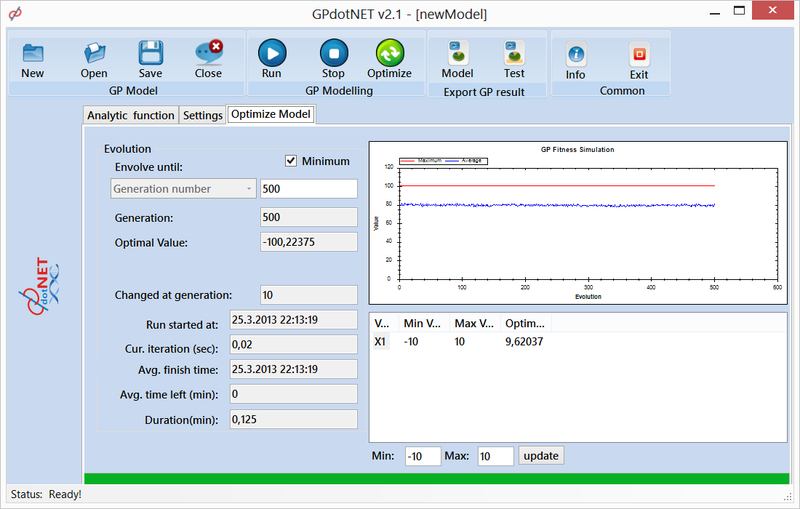 During optimization process GPdotNET is presenting nice animation of fitness values, as well as showing current best optimal value. The picture above shows the result of optimization process with GPdotNET. It can be seen that the optimal value for this sample is . 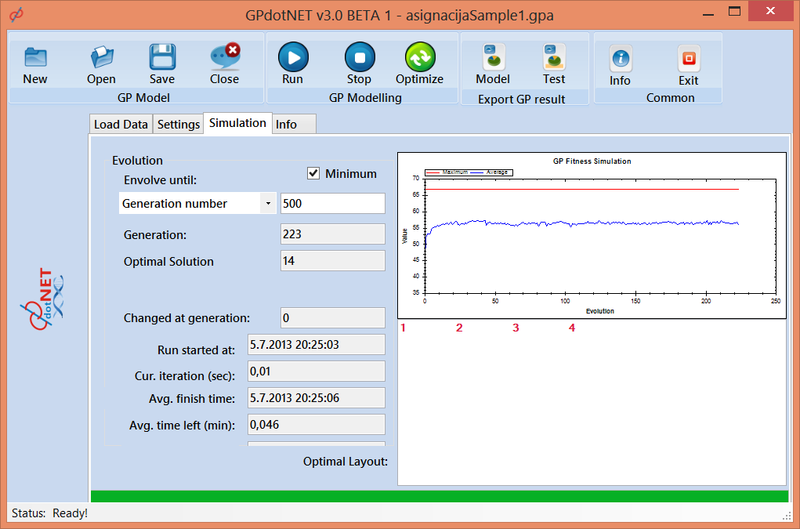 In this topic we are going to calculate optimal value for some functions by using GPdotNET. Zo be prove that the optimal value is correct or very close to correct value we will use Wolfram Alpha or other method. Optimal value is found (right above picture) for 0.054 min, at 363 generation of total of 500 generation. Optimal value is f(8.66,9.03)=-18.59. Optimal value is found for 0.125 min, at 10 generation of total of 500 generation. Optimal value is F(9.62)=-100.22. Easom’s function fEaso(x1,x2)=-cos(x1)•cos(x2)•exp(-((x1-pi)^2+(x2-pi)^2)), -100<=x(i)<=100, i=1:2. Optimal value is found for 0.061 min, at 477 generation of total of 500 generation. Optimal value is F(9.62)=-1, for x=y=3.14. Function can be seen at this MatLab link. When the chromosome is generated array elements get values randomly generated between min and max value defined by function definition. Here is a source code of Generate method. /// Generate number between 0-1. 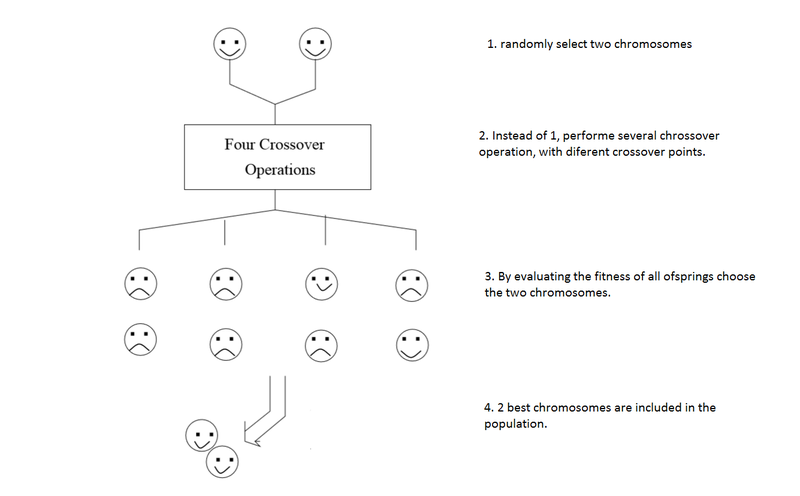 /// For each element array of two chromosomes exchange value based on random number. 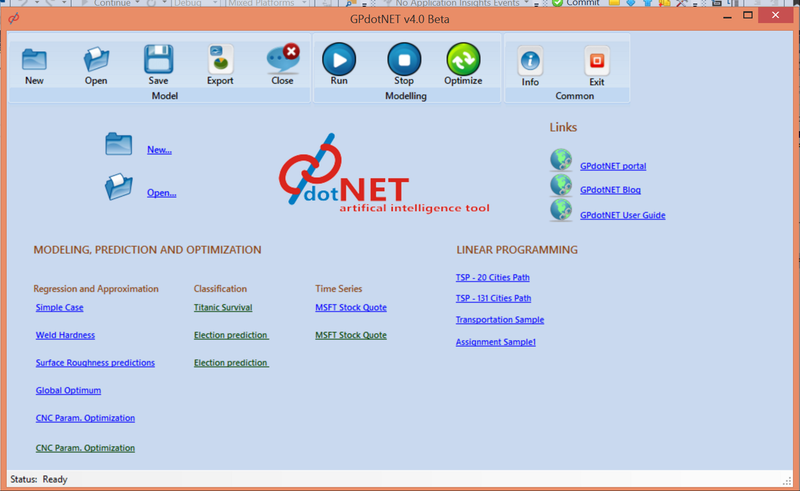 We have seen that Function optimization module within GPdotNET is powerful optimization tool. It can find pretty close solution for very complex functions regardless of number of independent variables. Optimization module use Genetic Algorithm method with floating point value chromosome representation described in several books about GA. It is fast, simple and can be used in education as well as in solving real problems. 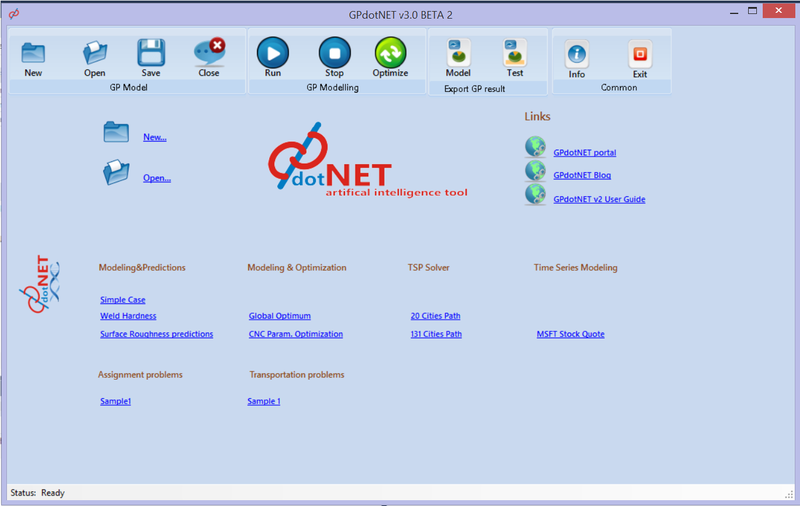 More info about GPdotNET can be found at https://bhrnjica.net/gpdotnet.